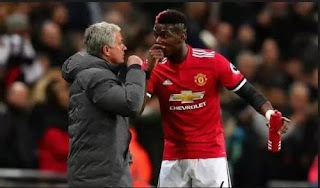 Manchester United manager Jose Mourinho is full of praise for France international Paul Pogba after scoring a brace in his side’s 3-2 win over soon-to-be crowned Premier League champions, Manchester City on Saturday, April 7, at the Etihad Stadium. The Citizens got off to a fine start with Vincent Kompany and Ilkay Guendogan scoring two first half goals for the hosts in the 25th and 30th minutes respectively. However, City’s celebration came to a rude shock, when the Red Devils came back into the second half with a winning mindset. Pogba scored two quick goals in the space of 90 minutes to give the Old Trafford’s side a lifeline in the game, while Chris Smalling’s 69th minute volley ensured Jose Mourinho’s men claim maximum points in that fixture. The Portuguese born manager while reacting to his row with the former Juventus man said it doesn’t matter who was wrong: “I have not spoken to Paul about that. I am not interested in who is right” – and went on to praise Pogba’s contribution over the past week. “He played well against Swansea, he produced some very good work in training, and along with Nemanja Matic and Ander Herrera he was phenomenal against City,” the United manager said. “At half-time I said I wanted my defenders to be more confident and need to see more from Jesse Lingard and Alexis Sánchez, but I told my midfield players they didn’t need to improve. “They were already playing well, and once we got the goals we knew we were mentally strong enough to see the game out. At this level you need to be clinical at the front and solid at the back. “We are sad for our fans, but we still have 84 points and now we have to be brave to stand up again and focus on Liverpool. “At Anfield the problem was that we did not create any chances. At least we corrected that here. Even after going behind we created good positions, and but for a good save from David de Gea we might have had another goal.” Meanwhile, United have reduced Manchester City’s gap on the log to 13 points with just six matches to wrap up the 2017-18 league season.